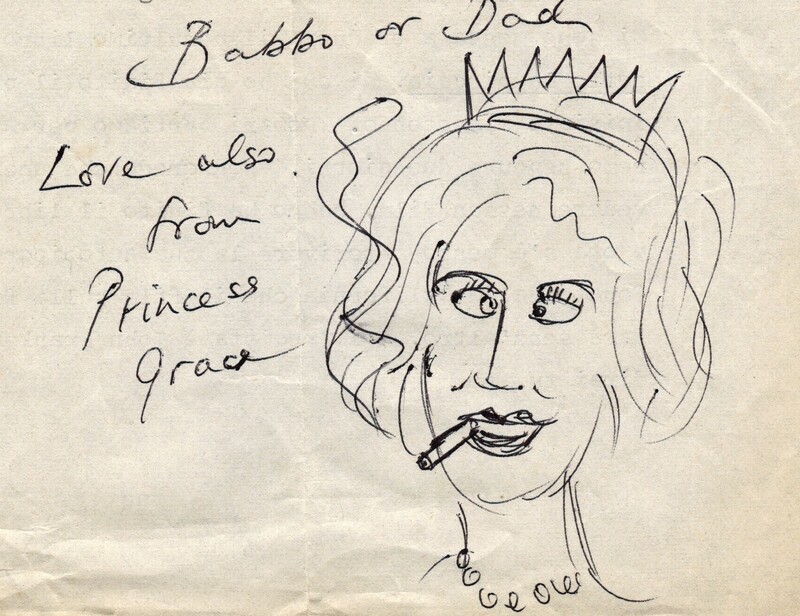 Many of the manuscripts in the archives at the International Anthony Burgess Foundation contain more than just words or music. 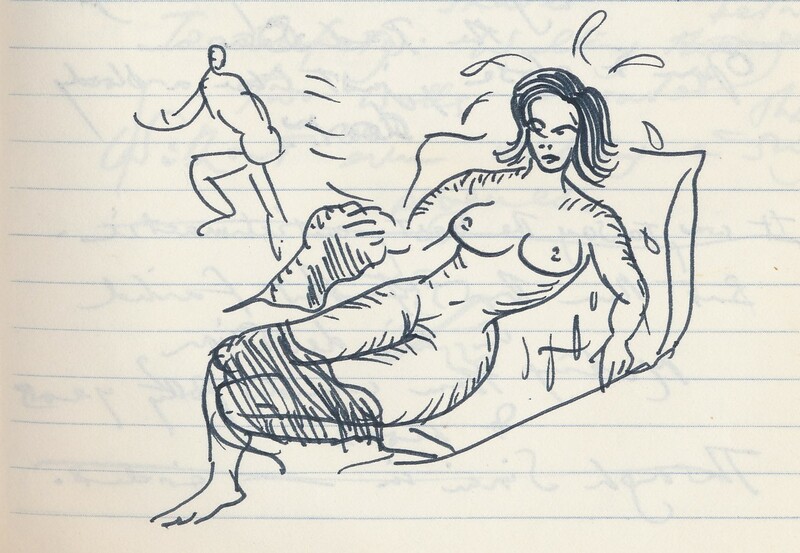 Burgess was a prolific artist, drawing in the margins of typescripts, creating title pages for drafts of his novels, and sketching birthday cards for his son, Andrew. Burgess’s first published piece of work was not fiction or music, but a cartoon he submitted to the Manchester Guardian in 1929. The twelve-year-old Burgess won a prize for his submission, which depicts his father, seated in an armchair. 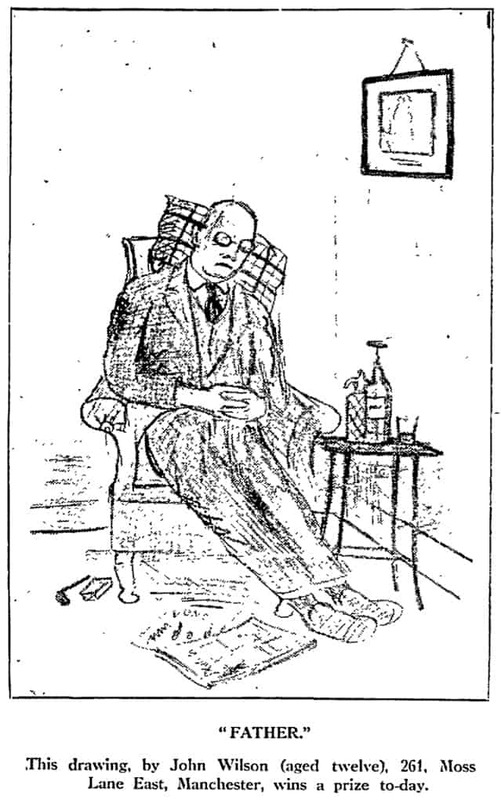 The detail of the drawing shows Burgess’s burgeoning talent for observation: the figure wears slippers, while a whisky glass and a soda siphon can be seen on a table next to him, a pipe and tobacco pouch on the floor by his feet. Photographs of Joseph Wilson in the image collection at the Burgess Foundation show the drawing to be a good likeness. A few of the typescripts of Burgess’s novels contain doodled marginalia, sometimes relating to the writing on the page, and sometimes with a more mysterious inspiration. 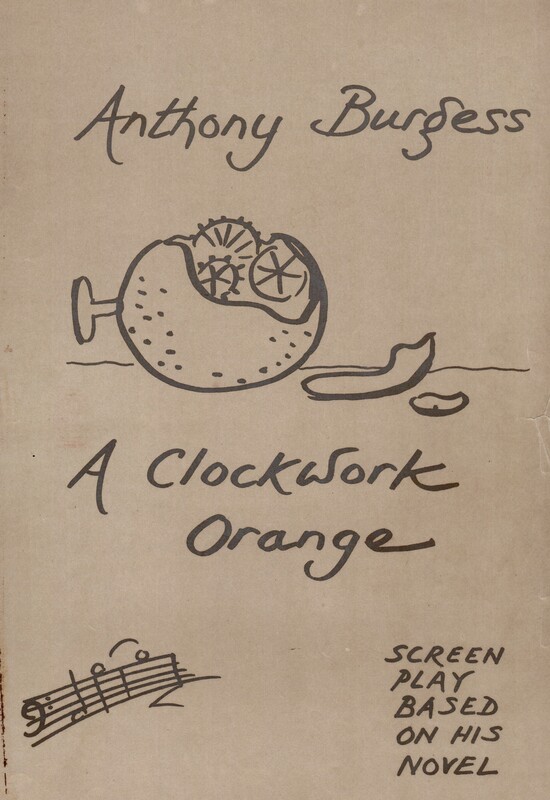 Ornamentations in the typescript of novels such as Beard’s Roman Women and A Clockwork Orange add humour to the texts, while the title pages of manuscripts such as Puma and Burgess’s original screenplay for A Clockwork Orange appear to give some suggestions as to how Burgess visualised the look of the published novel, though this is misleading. James Michie, who edited the UK edition of A Clockwork Orange, suggested that the drawings on the manuscript were a private joke between the author and his editor. 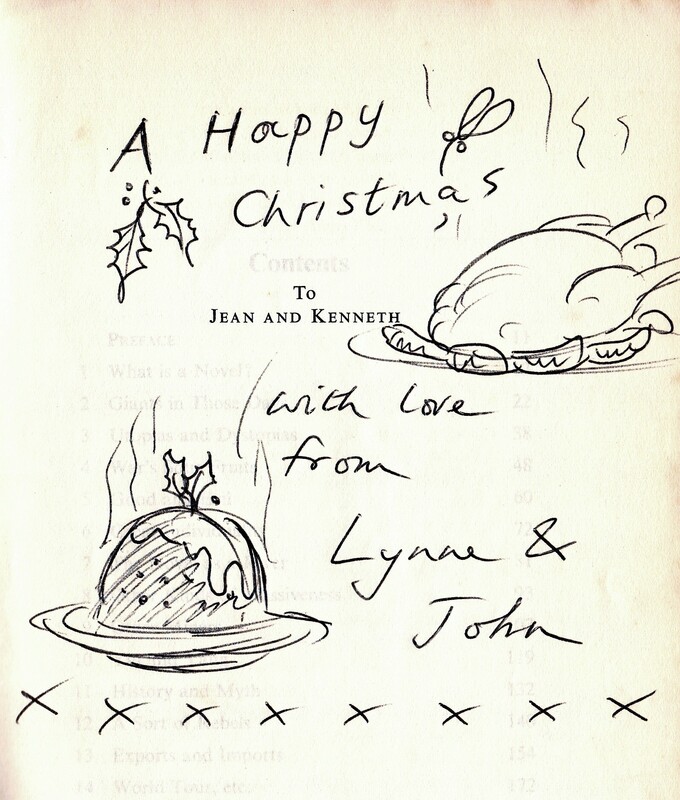 Burgess’s drawings also appear in more unexpected places: a Christmas scene, replete with a cooked turkey, in an uncorrected proof of The Novel Now, which Burgess evidently presented as a festive gift to his neighbours in Etchingham; a Scotland-themed birthday card for his son, Andrew, on which a proud, kilted warrior marches ahead of a Celtic army (top image); and doodles on numerous letters which depict famous people, including Princess Grace of Monaco (below). So damped her with the contents of the ewer. And ran away, the bloody idiot. 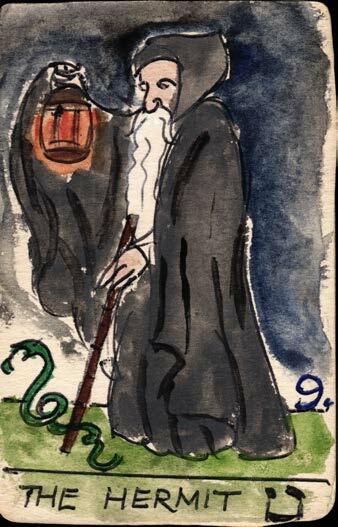 Burgess also designed various sets of Tarot cards, including images of The Fool, The Hermit and The Hanged Man. His interest in tarot extended to his writing, and is featured in novels including Earthly Powers and A Vision of Battlements. This was not the only set of cards he created. The archive also contains a set of playing cards based on the novels of James Joyce, featuring Burgess’s drawings of his favourite characters and scenes from Joyce’s works. 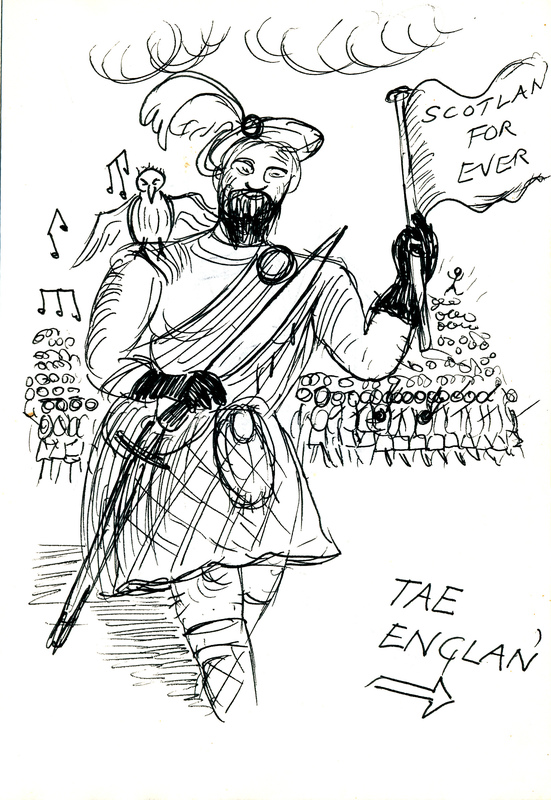 Burgess’s drawing was primarily for himself and the entertainment of those close to him, but, apart from the 1929 cartoon in the Manchester Guardian, there was one other drawing that was published during his lifetime. In October 1976, Harper’s Magazine published Burgess’s self-portrait alongside those of Tom Wolfe, Nadine Gordimer, and William Gaddis. 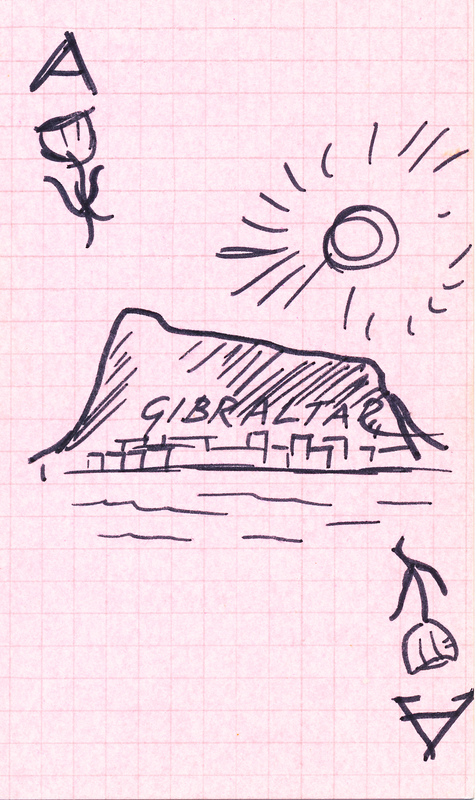 This image had originally appeared alongside an interview with Burgess in a 1973 issue of Paris Review.